Two weeks from now, endurance athletes Greg Kolodziejzyk of Calgary, AB and Jordan Hanssen of Seattle, WA will attempt a nautical circumnavigation of Vancouver Island, piloting the custom-designed, pedal-powered boat Within on its first long-distance ocean voyage. Greg and Jordan will launch Within on Friday, Oct. 23 from Comox, BC and travel clockwise around the Island. If successful, this voyage will mark the first-ever circumnavigation of the Island in a pedal-powered boat. The journey is expected to take approximately two weeks to three weeks, depending on weather and ocean conditions. British kayaker Sean Morley holds the current record for a human-powered trip around the island, completing a counter-clockwise paddling trip in 17 days, 4 hours, and 49 minutes in September 2008. Greg has previously set 2 human-powered records (land and water) for the longest distance traveled in 24 hours. Hanssen was captain of the American team who won the trans-Atlantic Ocean Fours rowing race in 2006 and has also cycled coast-to-coast in Australia - from Perth to Sydney. Kolodziejzyk's reason for this arduous journey isn't about entering the record books however. "My objective is to demonstrate the amazing things a human being can do under his or her own power. I hope to motivate and inspire more people to explore their own human-powered potential. It's good for the environment, it's essential for our health, and sends the right message regarding physical activity to our children." Hanssen says they'll be expecting the unexpected, "I think Vancouver Island is a complex coastline with complex water. I feel confident, but there are definitely a lot of things we will learn. As I was once told by a veteran sailor, it's all about how you recover from your first big mistake!" The Vancouver Island circumnavigation is the duo's first chance to put the boat to the test in ocean conditions and an opportunity to prepare for an even more ambitious journey, called Pedal The Ocean. Kolodziejzyk is preparing for a solo Pacific crossing from Victoria to Hawaii, currently planned for June 2010. Greg Kolodziejzyk is a successful entrepreneur who informally retired from the business world when he was in his mid-30s - to focus on improving his health and meeting new challenges. He started by signing up to compete in a triathlon. After losing 50 pounds racing and training, he went on to complete 12 Ironman distance triathlons, with a 4th place finish in his division at Ironman Arizona in 2006 earning him a coveted slot to compete at the Ironman World Championships in Kona Hawaii. Greg has also completed a dozen marathons and 2 ultra-marathons. He is currently training to complete his first 100-mile ultra-marathon. No person in history has traveled further under his own power in one day, on land or water than Greg. In July of 2006, Greg earned his first world record by pedaling his human powered vehicle called Critical Power 647 miles (1041 km) in one day around a race track in Eureka, California. 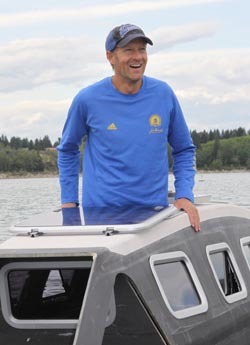 In September of 2008, he did it again, but this time on water when he pedalled his human powered boat Critical Power Two 152.3 miles (245.16 km) in 24 hours around a circular lake course in Whitefish, Montana earning him his second world record. Greg has been featured in the Guinness Book of World Records, Men's Journal magazine, Popular Science magazine, and on the Discovery Channel. Greg's state-of-the-art human powered boat was designed by award winning naval architect Stuart Bloomfield and human-powered boat engineer Rick Willoughby. WiTHiN is 30 feet long by 3 feet wide, weighs 455 lbs, and features a water-tight sleeping cabin, cockpit, and storage compartment. WiTHiN will carry enough dehydrated food for 100 days at sea. Fresh water will be supplied via electric desalination plant powered by solar panels. Greg's safety equipment includes a GPS, Satellite phone, survival suit, emergency life raft, and emergency beacons.